worlds of our planet | Sonic Smash-Music! The heavy metal music act known as Worlds of Our Planet has released a duo of singles under the collective title, “Laments of an Electric Guitar – Part I.” The release is a banshee’s wail of extremely melodic and remarkably complex heavy-metal guitar playing, and showcases not only a sheer mastery of the instrument, but also some of the most imaginative and inspirational orchestration the contemporary era has to offer. Its two component tracks, titled, “Painful Desperation” and “The War that Never Ends,” respectively, have a total of approximately 10 minutes’ playing time. Worlds of Our Planet makes certain that each tick, beat, and measure of those minutes is a global history unto itself. 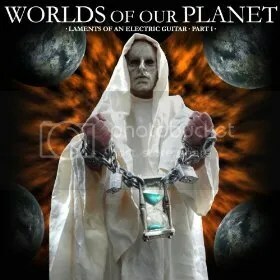 The actual sound of “Laments of an Electric Guitar – Part I” is violent, colorful, soaring, triumphant, decadent and dark. It spends long stretches entwined in harmonies and climbing fugues. In fact, the orchestration of “Laments…,” although a great work of metal music through and through, has much more in common with powerful compositions like “L’inverno,” from Antonio Vivaldi’s “Le quattro stagioni,” than it does with modern metal bands like “Dragonforce,” whose music does not necessarily always evoke emotion. The idea that the purpose of great art is to evoke emotion has existed for literally thousands of years, and it seems very much to be part of the philosophy of Worlds of Our Planet, the heart and soul of which is Marcos Micha Rayek. Like the music of Worlds of Our Planet, these thoughts may seem too deep and meaningful for some listeners, but Rayek assures his fans that it doesn’t have to be complicated. “Laments of an Electric Guitar – Part I” is available online worldwide beginning April 9, 2013.